The top diplomats of Russia and Japan held talks Monday about disputed islands in the Pacific as Moscow sought to temper Japanese expectations of an imminent deal. Russian Foreign Minister Sergey Lavrov opened the negotiations with Japanese counterpart Taro Kono by warning Tokyo against engaging in “unilateral rhetoric” regarding the territorial dispute — a stern statement signaling tough talks when the Japanese leader visits Moscow later this month. The Soviet Union took the four southernmost Kuril Islands during the final days of World War II. Japan asserts territorial rights to the islands, which it calls the Northern Territories, and the dispute has kept both countries from signing a peace treaty. Russian President Vladimir Putin, left, and Japanese Prime Minister Shinzo Abe shake hands before an opening ceremony of the cross-cultural year ofFILE – Russia and Japan at the Bolshoi Theater in Moscow, Russia, May 26, 2018. 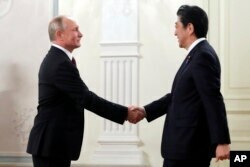 Russian President Vladimir Putin and Japanese Prime Minister Shinzo Abe agreed in November to accelerate negotiations based on a 1956 Soviet proposal to return two of the islands to Japan. Abe, who is set to visit Moscow later this month, has recently voiced hope that this year will mark a breakthrough in talks and spoke about an imminent change of the islands’ status — remarks that drew an angry response from Moscow. “Once again, I would like to ask our Japanese colleagues to strictly follow agreements by our leaders, both regarding the format of talks and, naturally, the substance of work on peace treaty,” Lavrov said. He also pointed at the U.N. Charter to reaffirm Moscow’s claim on the islands. Kono emphasized that the two countries need to solve the territorial problem to set stage for expanding their economic and other ties.